This tour combines a stroll through all 3 floor levels, guiding you through a food section, with opportunities for tastings, and a non-food section both of which embody the rich Hungarian heritage and culture that is expressed through foods and artifacts such as embroidery, porcelain, clothing and the arts & crafts. Taste a mouth-watering array of foods such as lángos, beef stew, potato paparikash, chocolate, strudel and much more, picking up fresh ingredients for your cooking class and enjoying the visual feast of goods laid out for sale. Along the way you will experience a unique slice of Budapest’s one-of-a-kind culinary culture. After the tour we head to our lovely apartment on the Buda side for your private hands-on cooking class. The cooking lesson lasts around 4 hours while you will learn how to make the traditional Hungarian dishes, you prepare 3 recipes from start to finish. The menu is subject of discussion. After cooking we eat the meals together. No cooking skills are required. Meals will be prepared with the careful guidance of your chef. Eat like a local in Budapest. At a restaurant you never experience true home-cooked food, the ‘Sunday family-lunch’ effect.” Our home cooking class is a great activity for those visitors who are looking for a local and authentic culinary experience in Budapest. All-inclusive pricing. Your market tour and cooking class includes all food & drink and an expert English-speaking guide. The food offered is enough for breakfast and lunch and also includes drinking Hungarian wine and fruit brandy, non-alcoholic options are also available. Fully customized event. You will enjoy a private hands-on Hungarian cooking class, a fully customized program covering exactly what YOU want to learn! Beyond the food. In addition to the wonderful tastes on the tour, you will get a fascinating insight into Hungarian life, beliefs and culture through learning about its food, cooking and culinary traditions. It’s so much fun! There is really no better way to see a city– the sights, the bites and the culture, this tour has it all! The cooking classes are private events and we need a minimum of 2 to do the cooking class. The maximum group size is 6. IX. district, Vámház körút 1-3. You can pay in cash after the cooking program, we accept Euros, US dollars or Forints. Our program comes with a 100% money back guarantee. If at anytime during the market tour or cooking session you decide it is not for you, you are not satisfied with our service, or you just expected something else, please let us know and you do not have to pay or we will be happy to refund your money. No question asked. You can decide what dishes you would like to prepare during your cooking class, please take a look at our ONLINE MENU and pick 1 soup, 1 main course and 1 dessert. Check out our photo gallery. 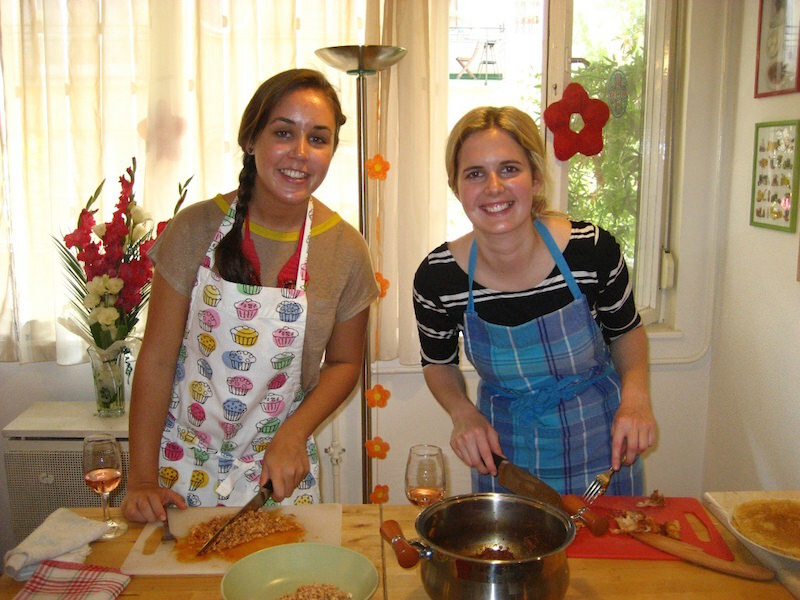 See pictures of our cooking classes, market tours and delicious Hungarian food. See what others say about their experience. Reviews from Culinary Hungary’s guests and customers who took our Market and tasting tour & Hungarian cooking class.